My article was originally posted on Thinking Aloud site. India is set to witness a very interesting and tough election in 2014. Politicians, political parties not only have to fight it out on the traditional media but now even on the internet, particularly the social media. Social media got its recognition in elections from Barack Obama’s successful and well run digital campaign. Obama may have won his first term in 2008 because of anti-incumbency but he won in 2012 because of his social media campaign. But the American parallel has its limits in being applicable to India. The internet penetration in the US is far higher than that of India. Targeting users on social media based on political affiliation is far easier in the US than India. The question every journalist is asking is – will social media be a game changer in 2014 elections. My answer is it will be both a yes and a no. Before we dive into this topic deeper it is important to look into some basic numbers in the digital space. Various stake holders of elections in India are curious to know how internet, especially social media, will influence our elections. In a recent article in Mint it was stated the total number of voters is estimated to be 725 million. The population of the country below 35 years of age is 51.8%. Of this 48.2% are women and 51.8% are men, 30.1% or 377 million reside in urban areas and 69.9% or 833 million is based in rural India. The critical demography category of 18-35 years of age is 31.3%%. According to a census conducted in 2011, India had 149.36 million first time voters who are expected to have a greater access to internet and newer media. India has a population of 1.2 billion and about 125 million internet users. About 20 million from India are on LinkedIn, the most popular social network amongst professionals. But the political class has knowingly ignored LinkedIn. Few reasons are addressed in the later part of the article. The table above shows the number of unique users in India for each of the social networks who are above 18 years of age (the voting age). On LinkedIn users don’t want to discuss their political affiliations as they are afraid if it will damage their professional career. Forget about promoting a politician you are a fan of, users refrain from agreeing or disagreeing with a political view seen in an article. The behaviour is understandable and possibly justified. On Facebook users seem to have a very guarded behaviour when it comes to politics. Users are conscious of how their friend circle would react in public. This is mainly because the friend’s circle on Facebook is very tightly linked because one has to approve the connection. Hence most political activity on Facebook is usually around issues that make the individual look good within their peer group. On Twitter the relationship between the handle and followers is a lot more loosely coupled. The relationships on Twitter are not intimate. Anyone can follow any Twitter handle, unless of course the Twitter account is a private one. This could be the reason why users are not that worried about how their tweets are perceived by others. Of all the social networks Facebook has shown far higher engagement levels. Is social media going to be a game changer? This would be the first general elections in India where social media will be playing a role. 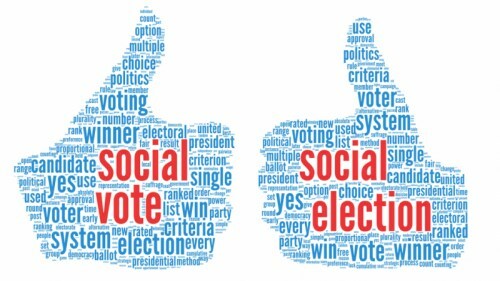 While social media may not directly impact a politician or political party it will create the peer pressure on the voters to cast their vote. As mentioned earlier the first time voters, especially the ones digitally connected could play a big role. Recent elections have seen a good turnout, well above 70%. Irrespective of campaigning and hash tag wars the real impact of technology has been in sensitizing and popularizing voter registration among youth. In your friend circle if you see few registering to vote there is a good chance you too would follow their steps. In view of this becomes very important for political parties to focus on campaigns to motivate people, especially the youth, to register and vote. It is very important for these campaigns to be of positive nature. People are tired of negative vibes, after all citizens know the facts of governance. Election Commission of India has taken note of social media seriously. EC is already monitoring the activity of few political parties, politicians and advertising expenditure on social media. However it is going to be a daunting task and there are many practical limits to it. The upcoming assembly elections to the five states would be the first time the EC’s ability to monitor and enforce its model code of conduct on Social Media will be put to test. Congress, BJP and Aam Aadmi Party political parties have taken social media seriously. However, each of these parties has a lot of work to do in making the Social Media Engagement translate into real votes at the Booth. Social media will have an impact on our elections. How big or small one has to wait and see.